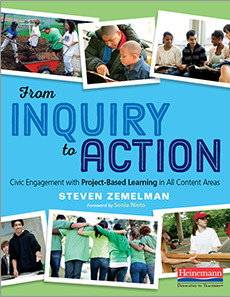 My latest post at Middleweb is an interview with Steve Zemelman, as we chat about the topic of student civic engagement and civic action in and beyond the classroom. With the student-led marches and with Parkland students emerging as leaders of a gun control movement, this seemed like a good time to focus on Steve’s new book, From Inquiry to Action. Steve and I know each other through our connections with the National Writing Project. His book offers a wealth of ideas for classroom teachers. Read our discussion over at Middleweb. This entry was posted in books, Middleweb. Bookmark the permalink.